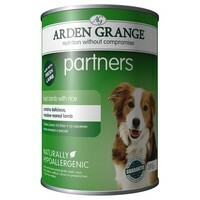 Arden Grange Partners Adult Dog Food (Lamb & Rice) is a nutritional hypoallergenic diet for all breeds of dog over 9 months of age; especially those with a dietary allergy or intolerance to chicken protein. Made with a high percentage of succulent meadow reared lamb, Arden Grange Partners provides a nutritious protein source, and a diet filled with the vitamins and minerals needed to provide your dog with the foundation of health and wellbeing. With boosted levels of vitamins, minerals, glucosamine and chondroitin, you can rest assure that your dog will be happy and active.